Would you like to make your own records at home ? 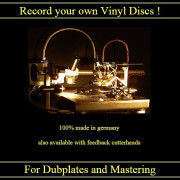 Check out the Dubplatecutter ! Find an original website specialized in cost sharing offering cheap pressings at 4x 100 copies ! Actually, this website is looking for a buyer. Website not yet launched. You’re searching for inner sleeves or disco sleeves in small or large quantities to protect your vinyl records ? Only in Dutch at the moment… English version is coming soon ! If you’re unable to finance your project, an alternative solution does exist. Did you already hear about Diggers Factory ? Diggers Factory allow artists and labels to edit and reissue their music on vinyl for free and without risk (crowdfunding). All that’s required is gathering enough pre-orders to fund and launch the production. (from 50 units). propose an entire ecosystem of partners to assist the artists (distibution, logistic, shipping worldwide, etc.). With Diggers Factory, No investment needed, no financial risk and you keep 100% control over your intellectual property.